The plus side to having nearly a 1000 channels is that there's always something on. I'll be honest, most of what's on tv is pure and utter rubbish, but sometimes you do come across something enjoyable. I was flicking through the channels last month and came across a pretty cool movie: Wild Target. It stars Emily Blunt as a conwoman/thief who hires assassin, Bill Nighy as a bodyguard. It was actually a really funny, light hearted movie and I found myself chuckling throughout. Rupert Grint (yup, Ron Weasly) plays someone who gets caught up in it all and is absolutely hilarious in it. I definitely preferred him in a role like this, rather than the brooding grumpy thing he has going for him in Harry Potter. The movie also has Rupert Everett, Martin Freeman and Eileen Atkins, so it's pretty star studded. What I loved the most was all the outfits Emily Blunt wears, but lets face it, she does pick the most stylish roles. She has great style in the movie and was in something gorgeous in every scene. She wears a lot of colour and I would raid her character's cupboard in a heartbeat. Now, I'm not the hugest fan of UGG's, but how awesome does she look in this outfit. The dress is stunning and the coloured tights are a perfect addition.Also, how amazing is that vintage suitcase? This was probably one of my favourite looks from the movie. The wet look leggings with those shoes is a perfect combination. The blazer is one of my highlights as well. When turned up, you can see pops of colour on the sleeves. And the print on the top is so gorgeous. This is a perfect everyday look that anyone can wear. Because it is predominantly cold in England, I'm always on the lookout for cool coats and winter wear. I love coloured coats, and this red one is the perfect stand out coat.More colour in this outfit.I also really adore the accessories, especially the blue beret. Emily Blunt looked gorgeous in this scene. From my research, I think this is actually a Topshop dress. I like how the dress is pretty understated, but she glammed it up with that amazing necklace. She also wore a fur shawl type thing across her shoulders, but I couldn't get a proper picture of it. Also, how pretty is her hair? Below is by far my favourite outfit she wore. I think we all know I have a slight obsession with my yellow Henry Holland skirt, so I loved this one. I love how she paired it with the gorgeous leather jacket, with the studs on, and she was also wearing the prettiest purple tank underneath. There you have it. One of the more stylish movies I've seen. Have you seen this movie? What do you think of the fashion? P.S. A huge thanks to Harriet, for putting up my Take10 Post for me while I was away. And that suitcase is amazing! I love Emily Blunt. I love vintage suitcases. 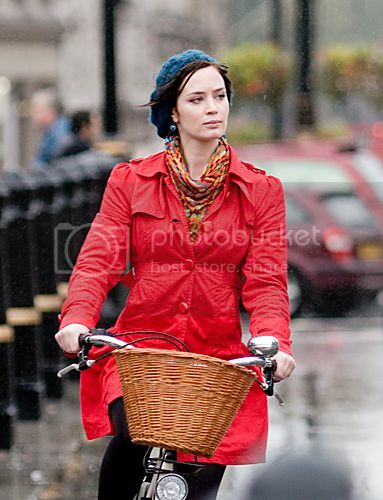 I love bikes with baskets. I think I need to watch this show! That is a Mina dress she's wearing in the first picture - I have it! I haven't seen this movie, but Emily Blunt looks fabulous! I really love those blue tights in that first look, though not a fan of the Uggs either! gorgeous outfits! I love the vintage suitcase, and the bike and the blue dress! I got a see this movie! This is one of my favourite films ever! I saw it in the cinema and absolutely laughed my head off I was so sad more people didn't go see it, but I'm glad to know I wasn't the only one who enjoyed it! ps no problem on the take10 post, happy to help! I haven't seen it yet, but I definitely want to. Thank-you for the comment my lovely, I love her style, the last one is amazing.. I'm loving the colour! I love Emily Blunt!!!! Oh, so many great looks here. I hav to watch that film now. Haven't seen the movie but thumbs up to the red jacket!